Welcome to Emily Williams-Wheeler’s world. It’s a world of colorful rabbits and birds and cotton-candy trees. It’s a world of self-expression and new discoveries. “Color is my strength and my passion,” Emily says. 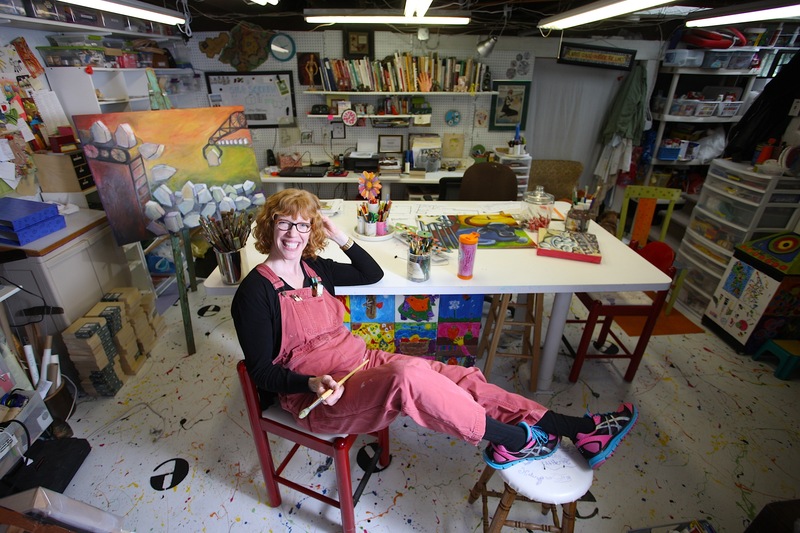 So whether she’s creating artwork to sell or painting a mural for a local mall or teaching creative-thinking classes to local children, the “Studio e” artist is always infusing her world with color. When we met Emily in early June 2013 at her home in Fargo, N.D., she had just opened a solo exhibit titled “Soup to Nuts: A Lighter Faire” at Kaddatz Galleries in Fergus Falls, Minn. Her children’s annual spring art exhibit had attracted more than 200 people. A month before, she had finalized the installation of a mural in the Children’s Playland in Fargo’s West Acres Mall. In 2012, Emily (’86 interior design) was named TOSCA American Artist Series North Dakota Artist of the Year. Her list of projects, workshops, shows, and other accomplishments covers four pages. She and her husband, John Wheeler (’84 meteorology), a meteorologist for WDAY-TV in Fargo, have two children, Maggie and Cameron, and two rambunctious dogs, Phinney and Ollie. Emily grew up in Iowa, and her initial impression of Fargo was not exactly positive. Now, although she “lives in a gray world up here” during much of the year, she sees color everywhere. “Or I put it there,” she says.